Ok, that is a possiblity but a curious way of putting it (why not "Available Soon"). Maybe that wasn't a choice in the drop down box in the ecommerce software. We're still holding off on taking pre-order for our Deluxe and Super Deluxed Limited Edition Masks of Nyarlathotep collections. We've got a couple of artifacts that are being redesigned to try and make them a little less expensive and lighter to ship. We hope to have it resolved soon. The radio play is in production and our prop department is dispatching jobs to our printers left and right. The stars will soon be right. We'll post some photos to our site soon. Any word on when you think it will be released? July 1st for the campaign according to several posts I've seen from MOB so my guess is probably something like September for the Radio Adventure. I think I may well pop a set of this. Some great stuff on the site, well laid out, but just the one thing. Constantly those pop ups keep, well popping up. Great that they are selling lots of stuff, but it seems pretty continual. I can attest to the extremely high quality of Brotherhood of the Beast. HPL Historical Society more or less sets the standard, in my opinion. I'll do my best to get in on this when it's offered for pre/order, but looking at that pile, the real scope of the scenario is driven home in a way that reading it doesn't quite get across, even 666 pages of it. As a Keeper, trying to run that is terrifying! If you're referring to the Gamer Prop Set -- it's already available for Pre-Order. I personally pre-ordered it back around June 10th or so. I have been awaiting the Deluxe set dropping so as to put in a pre-order with a certificate I have to pay for some of it. Looking on the HPLHS site, I don't see options for either the Gamer Prop set or the Deluxe set. Where did you see them? The Deluxe and Super Deluxe Editions are up on the website, but aren't yet available for pre-order. Thanks! I have seen those and saw that they're still not up for pre-order. I was confused by jlynn stating they'd already ordered the Gamer prop set but I guess that has now dropped on to the site but not the Deluxe. Again, thanks. The other two (Deluxe and Super Deluxe) were supposed to go up for pre-order back on June 15th, but they've been reworking a couple of the props to save weight (shipping costs), so they are on the back burner while they get the Gamer Props ordered and the radio play finished. Thanks. I had thought the Gamer Prop set had had the same issue with the redesign due to weight. In any case, eagerly awaiting the release of this DART. The Roleplaying Exchange have an audio interview with @shoggothsean and @ahleman about the project (among other things). Gamer Prop Set planned to be available for Gen Con (1st August). The HPLHS will be at Gen Con, inside Chaosium's "booth zone". Masks audio dramatisation due for completion around 1st September. Seems the place to put this. Is there going to be any advance notice on whether some of the props for the DARK ADVENTURE RADIO THEATRE - MASKS OF NYARLATHOTEP will be the same as the props for the MASKS OF NYARLATHOTEP - GAMER PROP SET. If not, and there is a possibility of crossover usage, then I'd get both. Question also applies to the deluxe editions. 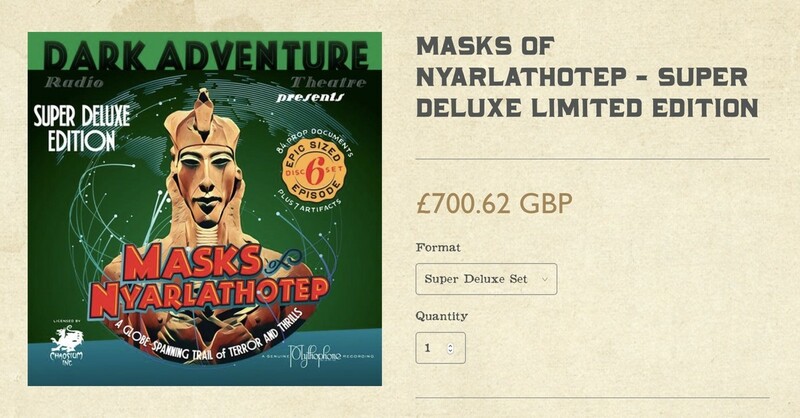 Also, I'm going to buy the MASKS OF NYARLATHOTEP - GAMER PROP SET, can anyone answer how the value of this could be offset off the MASKS OF NYARLATHOTEP - SUPER DELUXE LIMITED EDITION? As surely you'd have to pay for both and then be refunded part, which is not wise as there could be a payment provider cost / charge for HTPLS to transfer back an amount. Thought I'd ask. Of note, HTPLS must be doing good business as that pop up window shows they are selling a fair few. "Now, as Chaosium prepare to release a full updated version of it for the 7th edition Call of Cthulhu rules, the HPLHS is releasing a very special collection of props to enhance your role playing fun." Nothing about what edition it is actually for? I'd assume the 7th edition, but can anyone clarify? "1. Our Gamer Prop Set for Masks was specifically designed for use with Chaosium’s new supplement for the 7th edition CoC rules. It includes the Peru section and other additions Chaosium has made for this edition. 2. Of the props included with the Standard Edition of the Dark Adventure show, I think 3 of them are unique to the DART show - the rest of them are also included in the GPS. The DART Deluxe contains many more props which are specific to the DART telling of the story, not a gamer’s telling. For example, the GPS includes a telegram from Jackson Elias. The GPS props have been made so that any character could receive and use that telegram and it would make sense. However, in the DART show, the telegram from Jackson Elias is very personal, written by him for one of the heroes of the DART show. 3. If, for example, you purchase a GPS and decide to upgrade to our Super Deluxe edition, we will simply cancel and fully refund your purchase for the GPS. You should get back the exact same amount of money that you paid. If we have already shipped your GPS, we would simply not include a GPS set with your Super Deluxe. If your upgrade is somehow more complicated than this, we’ll find a way to apply the correct refund to your purchase. 4. If you purchase any of our Masks products and wish to add anything else from our store to your order, our store will calculate the shipping weight to send you your parcel. Generally speaking, it is substantially less expensive to ship an order that weighs 2.75 kilos than for us to ship one package that weighs 2 kg and a second one that weighs .75kg. The only hitch here is that the GPS and all of the rest of our products are shipping now. The DART, DART Deluxe and the Super Deluxe will not be shipping until early September at the earliest (we have to finish production on the audio before any of those can ship)." What other props (outside of the ones in the Gamer Prop Set) come with the Deluxe and Super Deluxe editions? That's the reason I haven't ordered this. Will there be a way to order the additional props separately? I think it's important to realize that the Gamer Prop collection is a completely different thing from the Dark Adventure Radio Play props. The Gamer Prop collection is for use with Chaosium's Masks of Nyarlathotep campaign, and includes all the paper props (and probably a good deal more) that you need to play that campaign. The DART Radio props are intended for use with their radio play. While there may be some cross-over and mutual applicability between the sets (and the Super Deluxe set is supposed to contain both the Gamer Props and the Radio Play props -- and a whole bunch more), they are still two different sets of props. Thank you, that clarifies it! Back in May I guessed the HPLHS Super Deluxe Edition would be about $1,000. It's $919 USD. Add in taxes and it creeps closer to $1K. Available to pre-order from noon on Monday (PST) for estimated delivery mid-November. Shipping is described as "frickin' expensive" – package weighs some 30 lbs (13.6 Kg). Welp. That's going to be well outside my price range until December, but by then, they'll all be gone, I'm sure. The good news is that thanks to Delphes Desvoivres and her outstanding props Kickstarters, I pretty much either already have or am very likely to wind up with the props listed there (the jury is still out on the Australia/Shanghai props set, since she hasn't started that Kickstarter yet, but I think I have everything else on the list, with the exception of the Bast Pendent and the Cultist Robes). Plus, I've gotten a few extra things not on offer in the super deluxe package, so I'm in great shape to finally run this thing when Delphes launches the last of her MoN Kickstarters. Adding in the Deluxe Radio play version should get me the rest of the paper props, plus the cool Carlyle Case File, so I think that's the way I'll go. I thought the announcement post for the Masks of Nyarlathotep Super Deluxe Edition would be on the other thread, as that's where the main conversation was? I'll post over there as that was where the announcement details were, I think?